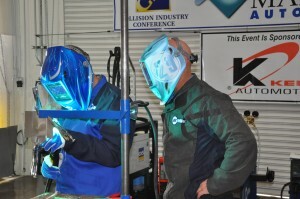 Welders attending an aluminum joining presentation last week were surprised with a pop quiz as well as a lecture. SCRS Education Committee member Toby Chess on Thursday tested the technicians gathered at Marina Auto Body Los Angeles on 1 mm-on-1 mm aluminum welding ahead of I-CAR’s making the procedure a certification requirement starting in July. “It’s pretty hard,” he said. One student passed on the first try, a certified welder from Pride Auto Body. “Some took three or four whacks at it,” Chess said. He gave the example of a qualified welder who’d passed the Mercedes test who on Thursday had difficulty because he hadn’t realized the different triggering procedure for the welding gun he was using. “It’s something you have to get used to,” Chess said. The event was a joint effort between the Society of Collision Repair Specialists, the Collision Industry Conference and Marina Auto Body and sponsored by Kent Automotive. Chess also drew attention last week to an product guide he was planning to release soon. The publication will critique the various aluminum welding options available on the market. “There’s all these guys out there, that make all these claims,” he said. Continue to check Repairer Driven News for more information following the guide’s release in the coming days. Chess will also be teaching two courses during the Society of Collision Repair Specialists’ Repairer Driven Education series at SEMA 2015. Get the entire lineup here and find out how to register. “Welding Technologies – A Comprehensive Tutorial on Modern Equipment” on Wednesday, Nov. 4, will seek to answer “what do I need, and where do I start?” for shops trying to buy the proper welding gear to weld a fleet increasingly dropping mild steel for other materials. “Repair Planning Considerations for Welded Components” on Friday, Nov. 6, will teach attendees how to incorporate “welded-replaced” procedures into standardized blueprinting — and not forget a step. “Estimating for these welded-replaced operations requires an understanding of the process, the equipment the joining mechanisms and the included and non-included labor associated with the operations,” the course description notes.